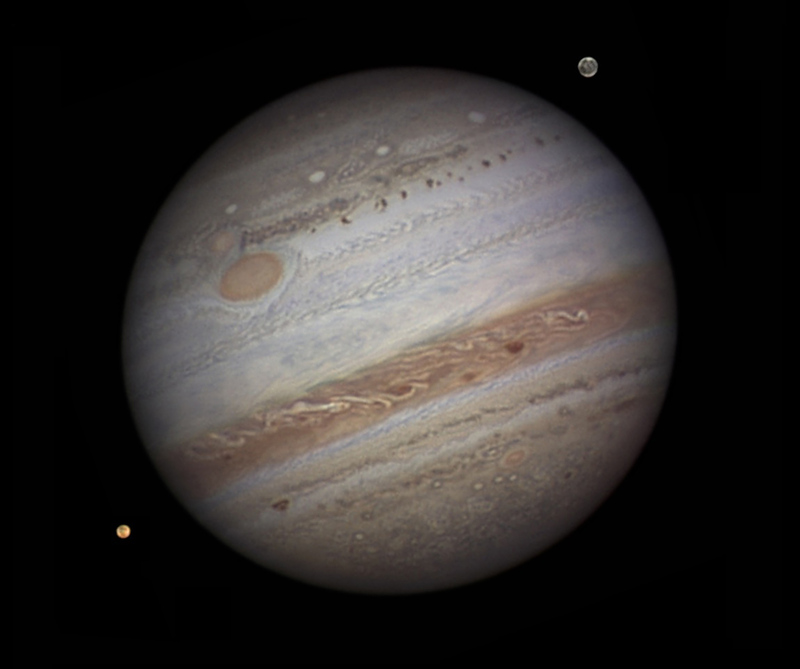 By far the two largest bodies in our solar system are Jupiter and Saturn. In terms of angular momentum: ‘That of Jupiter contributes the bulk of the Solar System’s angular momentum, 60.3%. Then comes Saturn at 24.5%, Neptune at 7.9%, and Uranus at 5.3%’ (source), leaving only 2% for everything else. Jupiter and Saturn together account for nearly 85% of the total. The data tell us that for every 21 Jupiter-Saturn (J-S) conjunctions there are 382 Jupiter-Earth (J-E) conjunctions and 403 Saturn-Earth (S-E) conjunctions (21 + 382 = 403). Since one J-S conjunction moves 117.14703 degrees retrograde from the position of the previous one, the movement of 21 will be 21 x 117.14703 = 2460.0876, or 2460 degrees as a round number. The nearest multiple of a full rotation of 360 degrees to 2460 is 2520 (= 7 x 360). Therefore 21 J-S has a net movement of almost 60 degrees (2520 – 2460) from its start position. The synodic periods all occur in multiples of six, and one sixth of 2503 years is 417.1666 years which is 21 J-S, 382 J-E, 403 S-E and two de Vries cycles. Since 382 is an even number, there will also be a J-E conjunction at the ‘half-period’ (averaging 208.58333 years) i.e. every de Vries cycle (191 J-E), while Saturn will be in opposition so J-S and S-E (odd numbers: 21 and 403) will also be oppositions, not conjunctions. 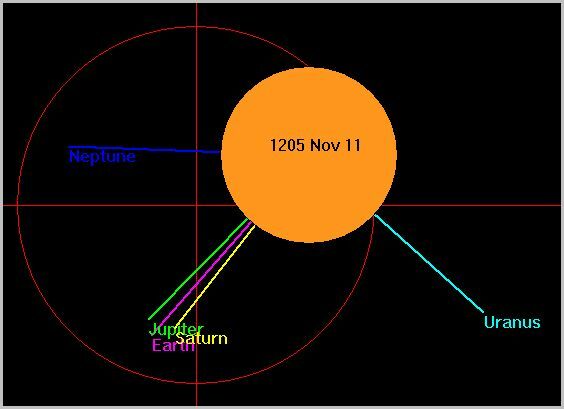 Thus the de Vries cycle has in theory two alternating configurations: one a triple conjunction of Jupiter, Saturn and Earth, and the other a Jupiter-Earth conjunction with a Saturn opposition. That would work if conjunction periods were uniform, but as they vary around a mean (due to known speed variations of the individual planets in their elliptical orbits) things will not necessarily be quite as exact. The effects of these types of planetary conjunctions are found in numerous studies, some discussed here at the Talkshop. Other possible mechanisms are analysed and these may suggest ways of identifying the factors behind when a de Vries cycle starts/ends. Another study noted: “the de Vries cycle has been found to occur not only during the last millennia but also in earlier epochs, up to hundreds of millions [of] years ago.” So there is little question that such a cycle is a genuine phenomenon. This puts the period itself in a Phi relationship with other significant Fibonacci multiples of J-S conjunctions, e.g. 89 (see here) and 233 J-S = ~27 Uranus-Neptune conjunctions. 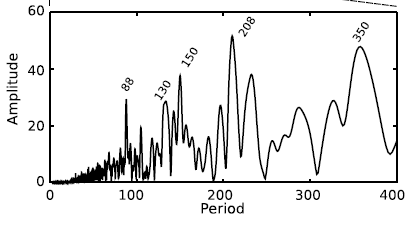 For example the number of J-E in 89 J-S is 1619 (1000 x Phi = ~1618). ‘The spectrum Fig. 2 (Fig. 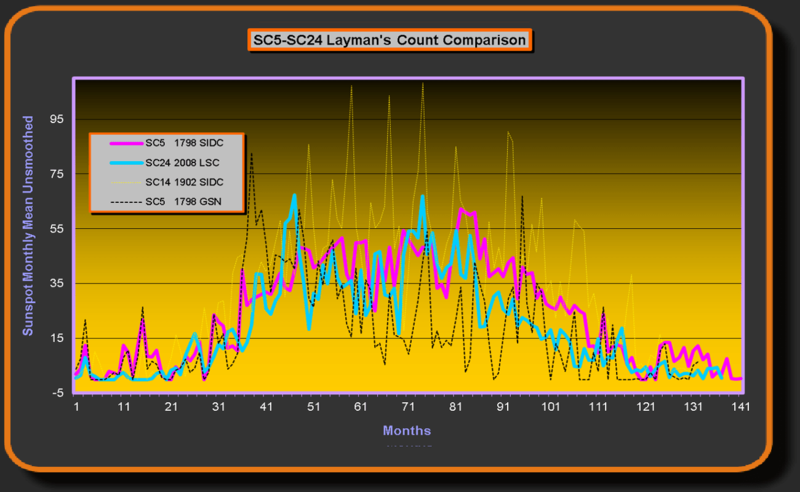 1d of ) shows clearly a 208-year period as the strongest variation of the solar activity’ – see graphic here. They also refer to ‘the last AMO/PDO minimum of 1940’, which is the year mentioned above where there was a strong Jupiter-Saturn-Earth conjunction. There may or may not be a better candidate for the start of the current 2503-year planetary cycle. Note also that 2503 years minus half a de Vries cycle (~104.3 years) closely matches 14 Uranus-Neptune conjunctions (2399.7 years). Correlations, not effect of: “The effects of these types of planetary conjunctions are found in numerous studies …” unless you have a solidly based mechanism for a linkage. PDO is just a vague pattern of moving around heat, very little is known. It does fit the form of top heated water showing chaotic emergences without that necessarily being the explanation. Coriolis force in physical basins shapes the form. I think this will be an very sensitive processes, marginally stable for at least some of the time. The process there will be chopped by earth rotation further breaking up quantising at short timescales. Earth orbital variation sets another part of the regime via varying insolation. Seems to me you are talking about a slower regime mixed with noise. 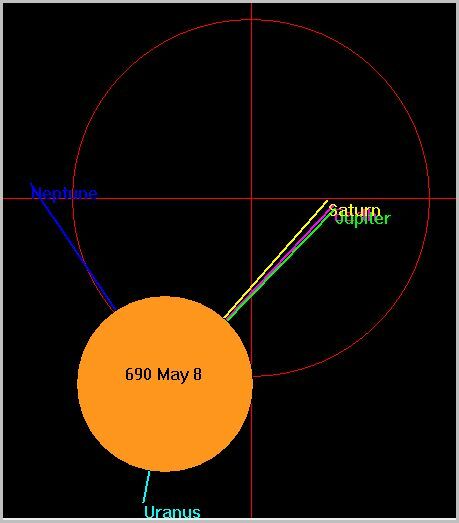 There was quite a good Jupiter-Saturn-Earth conjunction in 1107 AD (which fits into the ‘gap’ between the 690 AD and 1523 AD ones in our blog post). Solar cycles 5,6, and 7 could be the forerunners of cycles 24, 25, and 26. The start of cycle 5 was just under 210 years before the start of cycle 24. I so wish progress could be made on identifying a mechanism. We are left with the humour from fiction, a sufficiently high technology is indistinguishable from magic, so it may be with the universe. 27.0298 day frequency shifts correspond with stratospheric volcanism on a quasibiennial-bidecadal framework that fits pentadecadal & de Vries. As the sun’s mean magnetic equator migrates meridionally, zonal frequency shifts commensurately (d’oh!). So again we’re reminded that time-only methods can’t do the job. The temporal dimension is confounded with the spatial dimensions in statistical aggregations based on false spatiotemporal assumptions. The issue isn’t with unknown mechanisms; rather it’s with camouflaging aggregation criteria (deliberately presumably, to obfuscate). Solar inertial motion must be in the mix re mechanisms. The Sun’s position can vary by over 2 solar radii from the solar system barycentre, putting it closer to, or further away, than usual from its basic position at the centre, and possibly this movement can alter conditions on the Sun itself. The driver for the movement is planetary configuration of the giant planets, mostly Jupiter and Saturn but in some situations Uranus and Neptune as well. Fairbridge spoke of a ‘900-yr ‘great inequality’ of the motion of Jupiter and Saturn’ but looking at the de Vries cycle that would work better as a 834.33 year cycle (2503 / 3) = 4 de Vries. There are other more recent papers than this by other authors, but just to point out the SIM as a factor this one is OK.
NB the 179-year period = 9 J-S and there would be 14 of those in the 126 J-S period discussed in the post above. I tried another website (having quoted Wikipedia above) and it said 71% for Jupiter AM, so it seems there’s no agreed range for this. The Jose cycle defines QBO slip relative to BDO (J-S) (1 coin, 2 sides)…and it’s a trivial step from there to 1470. The time of the year of the (volatility-inducing, shape-shifting) variance (not to be confused with the mean) of earth’s distance from the SSB is what we overlooked back then. Days of the year differ due to asymmetry (e.g. land/sea distribution) …and the ever-assumptive mathematicians naively thought a day is equivalent to any other day (d’oh!) …and therefore (linearly) overlooked the key (nonlinear) subharmonics ….and the “physicists” pretended there were no physical differences (e.g. between hemispheres) affecting circulation. In sidereal years this is exactly (not approximately) the 8th harmonic of J-S (BDO) (background link 2). This solves the mystery of the 79.5 year translation symmetry in stratospheric aerosol optical depth. Not all days of the year are advectively equal due to asymmetric (notably north-south) land-sea distribution. Thus to be physically realistic, subharmonics can’t be ignored. 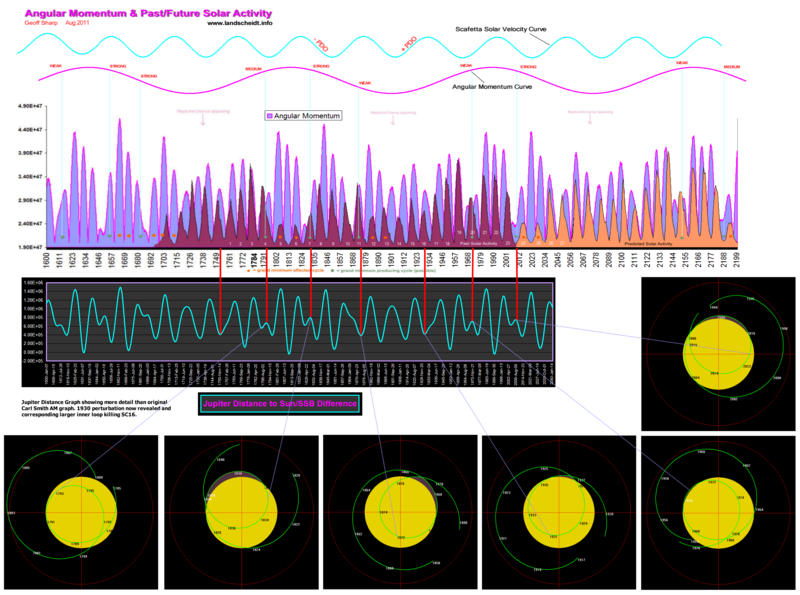 Ignoring subharmonics is equivalent to assuming summer & winter circulation are the same. So that explains the coherence with Chandler beat with nearest BDO (J-S) harmonic. In Summary: Now we know that the pentadecadal cycle (52.4 years) is a trivial zonal frequency modulation caused by meridional migration of the sun’s mean magnetic equator. That’s what I suspected in 2008 based on aa index, local weather records, & earth orientation parameter records, but resolution of the framework is clearer with hindsight. Pulkkinen, P.J. ; Brooke, J.; Pelt, J.; & Tuominen, I. (1999). 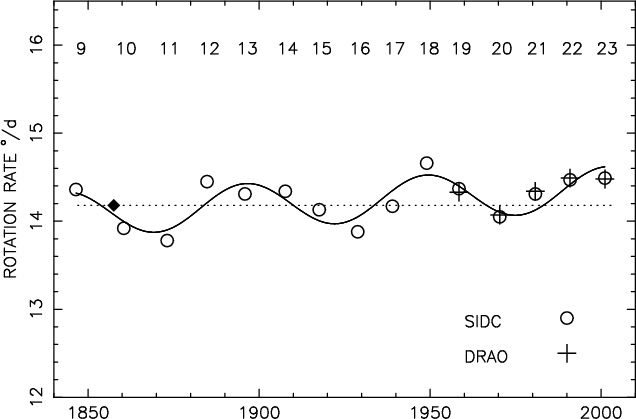 Long-term variation of sunspot latitudes. Astronomy & Astrophysics 341(2), L43-L46. Heristchi, D.; & Mouradian, Z. (2009). The global rotation of solar activity structures. Astronomy & Astrophysics 497(3), 835-841. That’s the annual side of the coin. JEV ~= J+N & frequency shift on that framework due to solar cycle deceleration (SCD) controls evolution of the other (semi-annual) side of the coin. The mistake the mainstream makes is that they don’t look for quantities that are conserved when exploring climate oscillations. Climate’s a balanced multi-axial differential only relative to conserved quantities. It’s a trivial exercise (a single beat calculation) to expand the preceding framework to DO = 1470 years. It’s also a trivial exercise to derive the 9-11 N+S & |N-S| versus N-S sunspot asymmetry framework from the preceding. The Chandler wobble phase reversal is no longer a mystery. Those 2 papers are key to fathoming the connection between geometry & frequency shift. 1. 27.03 day solar rotation — as you can see from new notes above, the coherence is even tighter than what I realized then (…and the unfinished mysteries I threw in the appendices back then are now resolved). 2. BDO = bidecadal oscillation — solar barycentric radial acceleration (period J-N ~= 12.8 years) governs high-frequency Earth-alignments inside the J-S (19.86 year) barycentic sun speed envelope. Mainstream ignorance of celestial roots of QBO (quasi-biennial oscillation) kills credibility. 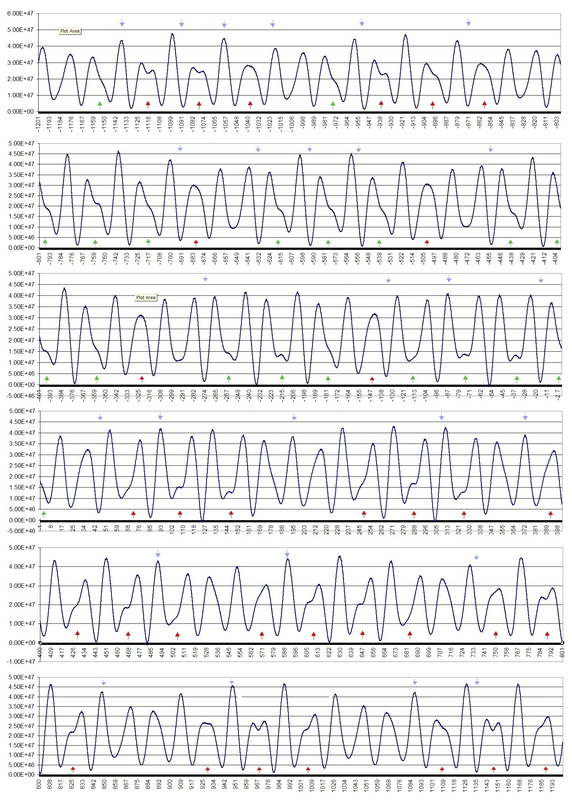 An underappreciated aspect of BDO: simple, systematic spatial pattern shifts (…at thoroughly unsurprising dates). 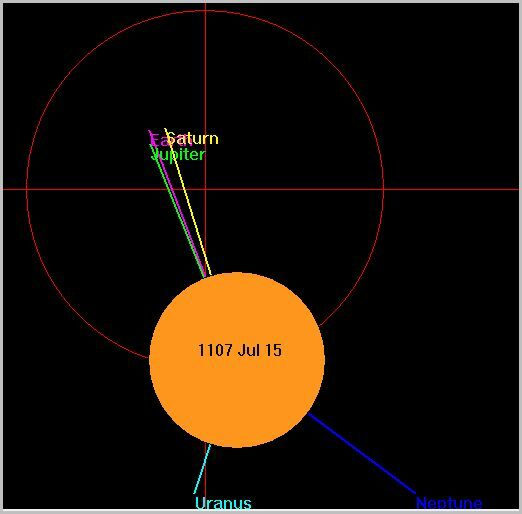 We know that 89 J-S is close to 60 Saturn and 149 Jupiter (149 – 60 = 89) in 1768 years. This post shows 126 J-S is almost 85 Saturn and 211 Jupiter (211 – 85 = 126) in 2503 years. It follows that 37 J-S (126 – 89) is around 735 years (2503 – 1768). 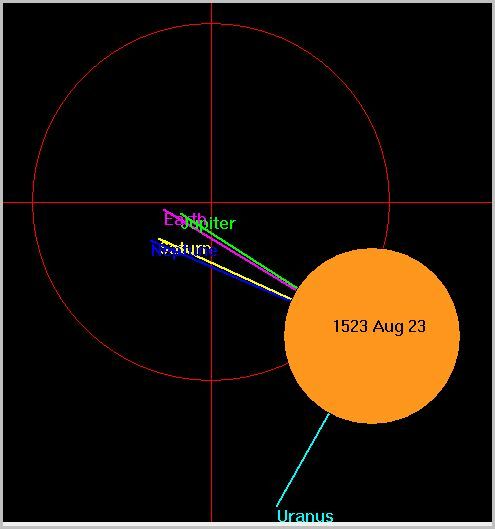 735 years is half of 1470 so a Jupiter-Saturn-Earth conjunction would be expected around both those time intervals, because all three planets would be close to a whole number of orbits (24.96 S = 62.96 J = 735.006 E). 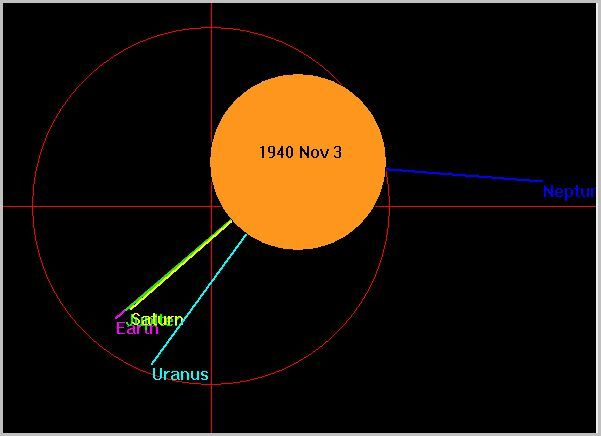 Looking back 735 years on the solar simulator from the November 1940 J-S-E conjunction shown in the graphic above (see post), there is indeed a close J-S-E conjunction in early November 1205. As illustrated in the BDO thread, these also align uniquely with the terrestrial year, so there’s something orders of magnitude more special about 1470 than what was previously realized. It’s an important paper about the 52.4 year solar rotation rate cycle. Integrated with the info in the other paper, a very clear picture emerges. I gave 2 links to the 1st paper on purpose. It’s an important paper, so I gave a backup link in case one of the links breaks (a common occurrence) in the future. Rotation rate varies with absolute meridional displacement. The interpretation and speculation in the conclusions of the 2 papers can be dramatically improved by integrating parallel insights. 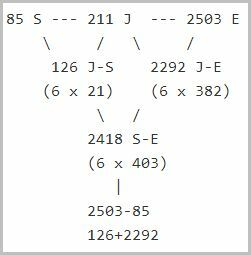 The 2503 year period of 21 x 6 J-S has a 1/3rd period of 21 x 2 J-S = 834.33~ years (~1 year less than 835.546~y). That would be 4 de Vries cycles in theory. The A&A website seems to be having intermittent issues today. The links worked. Then they didn’t. Now they do again. Try again later if you’re timing gives bad luck. Meanwhile I’ve linked directly to a graph of the key result above. Re Chandler wobble: Ray Tomes pointed out the beat of the CW is (CW * 1 year) / (CW – 1 year). For example, if we assume 54 CW = 64 years then 1 CW = 432.8888 days. 432.8888 / (432.8888 – 365.25) = 6.4 years = 10 beats (64 – 54) per 64 years. More on the planetary AM values. I was assuming that measured planetary angular momentum was the same as the planet induced solar barycentric displacements, which looks to be incorrect. Back in Feb 2009 on Carl’s blog reader AndyR posted his calculations in respect to solar barycenter displacement. These figures agree visually with the AM values on Carl’s graph and also enable a negative AM value when J is directly opposite S,U,N, but I have been unable to find an official table so far. J was directly opposite S,U,N around January 1990 +/- a few months. J opposite S,U,N must be fairly rare given that U-N on its own is a 171-172 year event. Maybe there’s a link to solar grand maximum given the 1990s peak? Yes and no, it all depends on the grand minima that can happen 20 years either side of the J opposite S,U,N position. 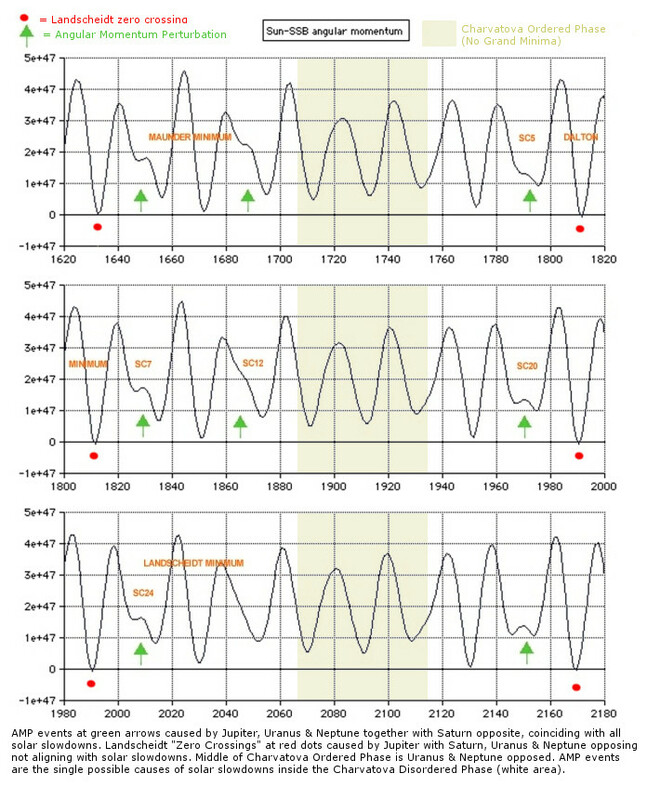 The sunspot record is a good example, the modern maximum happened because the SC20 chance was not strong enough and in reverse the LIA where grand minima chances are stronger and disallow a run of high sunspot cycles, grand minima can completely override a high AM cycle at J opposite S,U,N (zero crossing) . I think every 172 cycle (Gleissberg) has the same opportunity to produce high cycles at the U/N conjunction but is at the mercy of the grand minima of that epoch. I also think this goes hand in hand with the DeVries “cycle”. The strength of the J,U,N with S opposite configuration determines the length and depth of grand minima which control the length of time between grand minima. No other configuration is necessary. The zero crossing (Landscheidt) is shown on Carl’s original graph via the red dots (the green arrows came later) which can be close to grand minima and also quite some distance. But if the red dots are considered to be near the U/N conjunction, grand minima are never found at the point between the red dots (U/N opposition). Charvàtovà was all over this but did not and still does not see the importance of what creates her disordered period at the green arrows. She thought (2007) SC24 was going to be a carbon copy of SC11, which I cant quite understand. We can go back much further with the AM graph where we see far less zero crossings as we go back in time. This is because the planets vary their positions gradually and do not repeat any patterns until we get to 4627 years. This is also the reason I think for all grand minima chances being different and hence the most common gap of 208 years. We now have a 20,000 year ephemeris which allows us to see the 4627 cycle. Ken McCracken was kind enough to pass on the solar distance to the SSB over this period which shows a very close repeat that is hard to argue against. All 3 epochs overlay almost exactly. The Uranus-Neptune conjunction peaked early 1993 so would seem to fit into this view. This seems a fairly common view these days so it will be interesting to see how it pans out temperature-wise. Scientists Grant Earth Another 15 Year Reprieve!